Custom contemporary one level home in private gated small community. Pine Crest Estates is accessed from Ball Road in Alta Sierra. Private paved road access, this parcel is at the end of the road in the Estates. 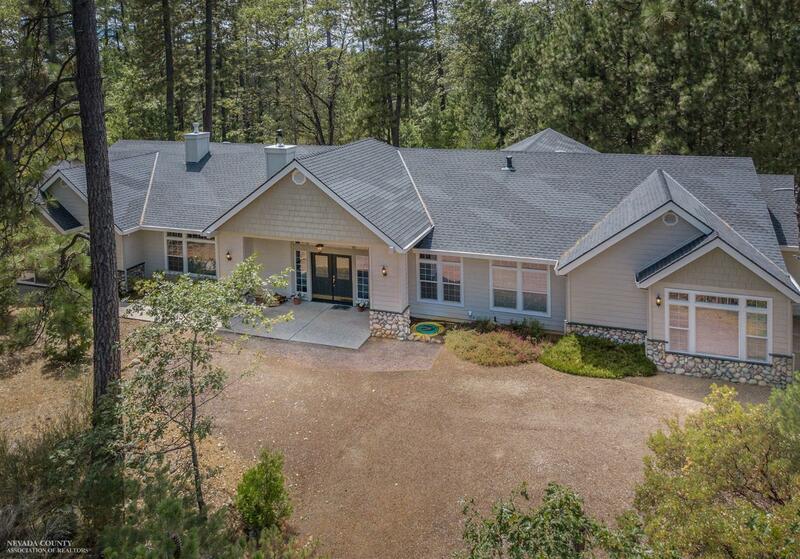 Just minutes back to Grass Valley and easy access to Hwy 49, this has one of the best 3 acre locations in the County. Handicapped friendly, sellers love the ease and comfort of one level with no wood decks. 9 foot ceilings with 10' coffers and plenty of windows which go almost to the ceiling bring a lot of light into the home plus give views of both sunrise and sunset. Family room on one end can also be used as private space for additional family or caretaker. Huge garage for storage or can fit up to 6 vehicles! Natural landscaping for privacy and easy care with concrete patio out back. Property is near level.